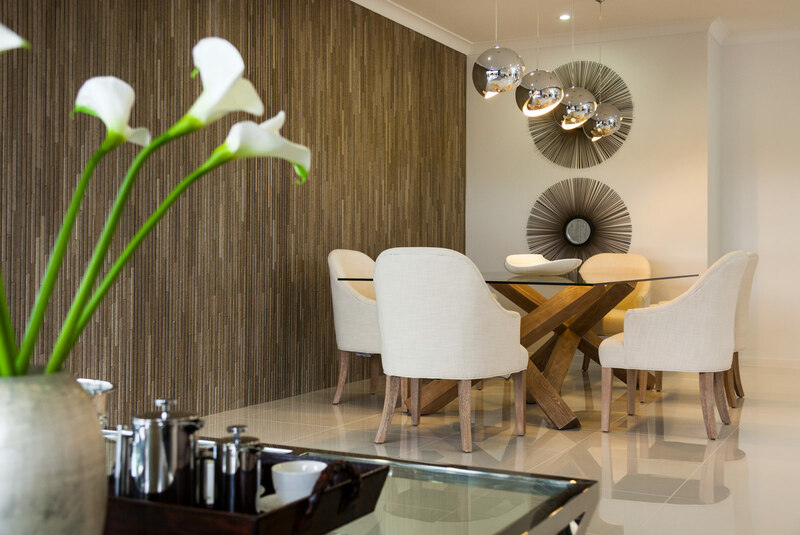 Take your feature walls from flat to fantastic by introducing 3D textures, sophisticated natural elements and the tactile allure of vertical cladding in your home. This bold design statement has the power to instantly add drama and completely transform even the most unassuming of spaces. For advice on how to master this trend effectively, here are Stylemaster’s top tips for taming textures for your walls. Recent trends have favoured this natural look for its rustic textures and neutral yet diverse colour palette. 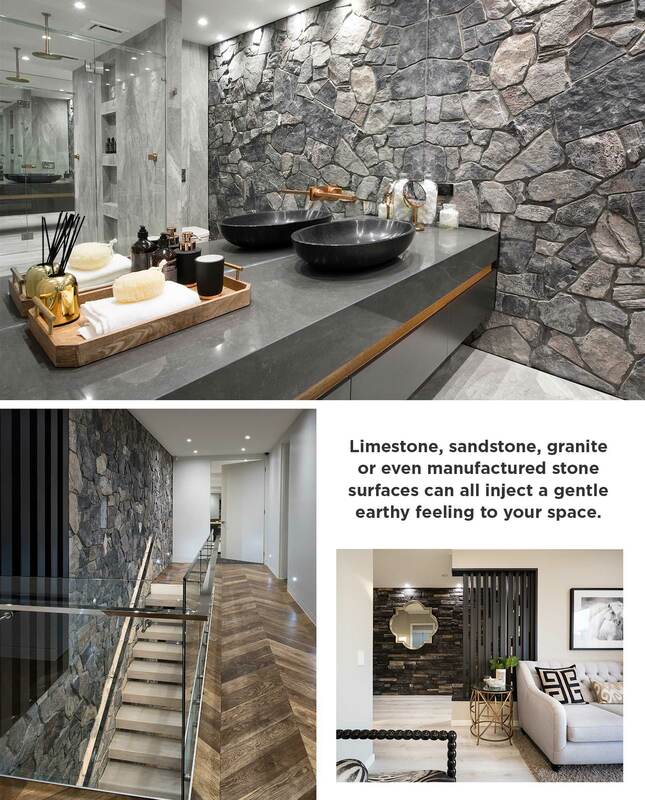 Limestone, sandstone, granite or even manufactured stone surfaces can all inject a gentle earthy feeling to your space. Stone works well when combined with other natural elements like timber flooring, woven rugs and soft linen upholstery to maintain a feeling of cosiness. Stone is particularly effective when applied to a fireplace or mantle and makes a stunning impact when used on an entire wall. However stone cladding can be very expensive and considerations for the weight of this product will need to be made during construction. On the plus side, when selecting a feature for a bathroom wall, consider that the vanity mirrors will double (or even triple) the impact of the stone you use! Timber cladding offers unique warmth to any space and is available in a stunning range of species. These sophisticated natural timber options bear little resemblance to the tongue and groove or sixties panelling of yesteryear. 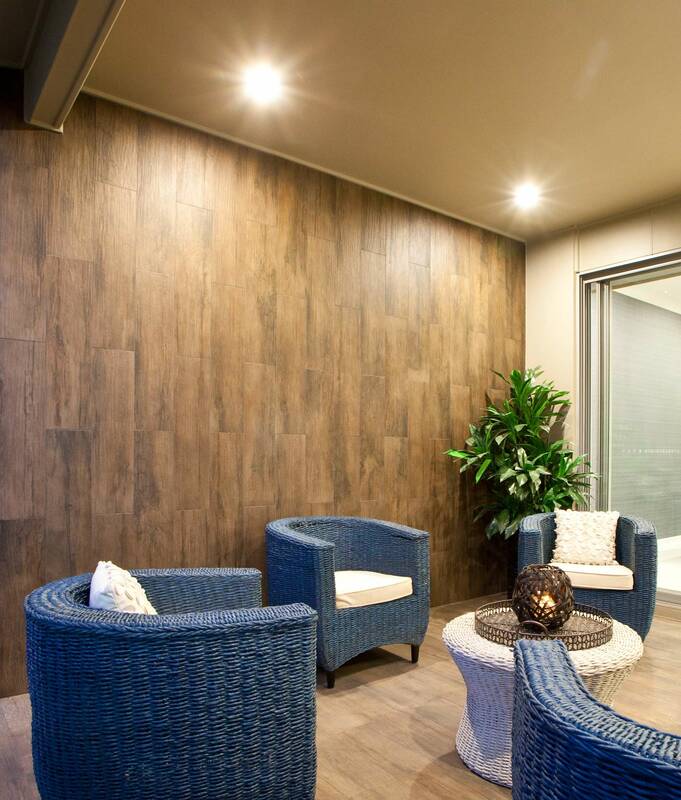 They are available in different veneer cuts to highlight the natural grain, can be manufactured in irregular shaped panels and installed with subtle shadow lines to highlight the individual panel placements. Screen wood is another attractive timber cladding option and can be installed on both walls and ceilings for a clean linear effect. 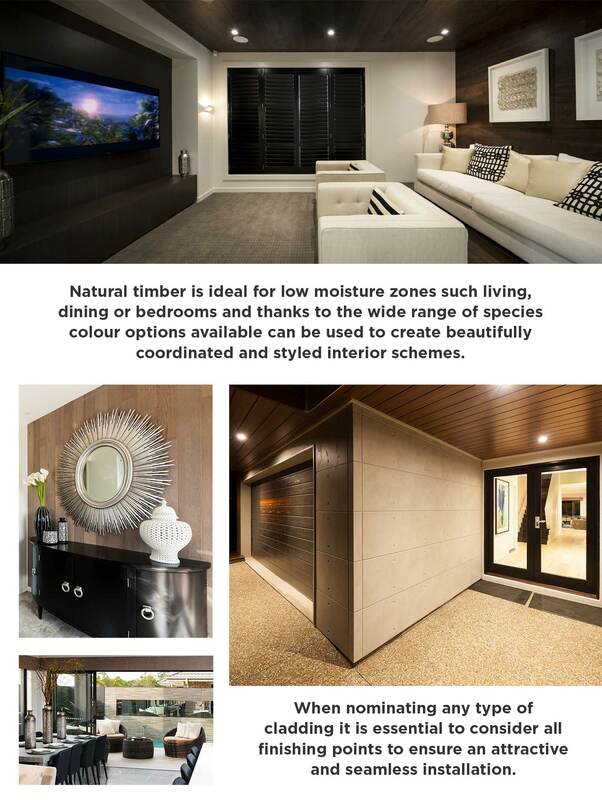 Natural timber is ideal for low moisture zones such living, dining or bedrooms and thanks to the wide range of species colour options available can be used to create beautifully coordinated and styled interior schemes. Always note, when nominating any type of cladding it is essential to consider all finishing points to ensure an attractive and seamless installation. In recent years the finishes, colours, shapes and sizes available in tiles has become increasingly impressive. 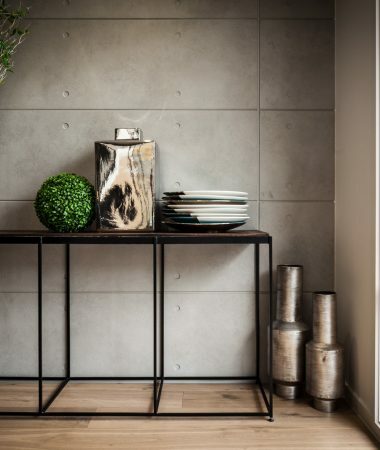 Slick new rustic surfaces combined with metallic accents, highly polished porcelains in soft sludgy tones, and even tiles that resemble timber boards – in both colour and texture! New mosaic tiles are shifting shape and can now be found in a huge variety of patterns, colours and even combinations of 2 or more different materials. Many floor/wall tiles also have matching mosaic patterns so you have the option to retain a singular colour scheme yet introduce interest by using a contrasting shape. Tile cladding has been incorporated into features for housing facades for many years now and can be difficult to get right. Less is definitely more in this case and ideally tiles work best alongside the clean finishes like painted render and carefully considered timber detailing. Wallpaper has endured a struggling comeback over the past 10 years, but has finally proven the designs, finishes and production technology of today are light years away from our childhood memories of Grandma’s house. Open any home magazine right now and you will undoubtedly find mention of this versatile product. While the finishes range anywhere between handmade organic and stylised chic, the key word is texture. The tactile weaves of grass cloths intertwined with metallic and silken threads are a favourite right now and subtly incorporate different colour combinations into the neutral weaves making it easy to find one that ties the elements of your room together. 3D vinyl and surfaces featuring patterns in miniature glass beading, flocking or foil are also very much on trend. It is recommended to limit wallpapers with delicate finishes for high traffic areas. For example, glass beading looks incredible but only when the finish is immaculate and no one has been picking off the beads! 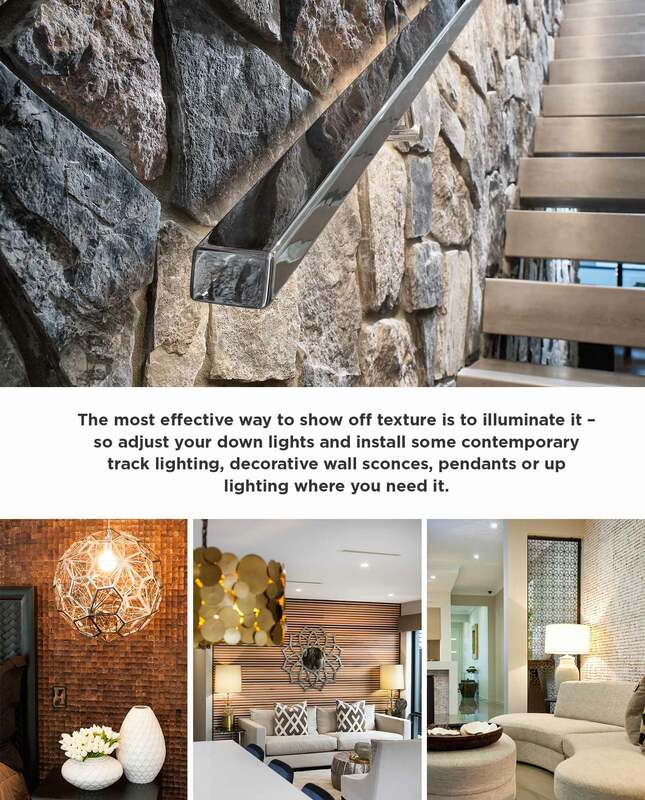 The most effective way to show off texture is to illuminate it – so adjust your down lights and install some contemporary track lighting, decorative wall sconces, pendants or up lighting where you need it. Even bedside lamps and candles can give you the subtle glow necessary for adding interest to your carefully selected surfaces. 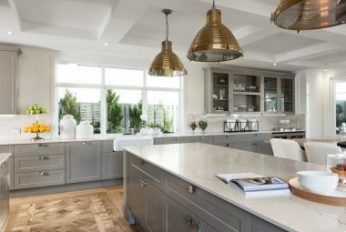 A well-chosen lighting scheme is particularly important for enhancing subtle metallic features in wallpaper or tiles, or for creating gentle shadows on a natural stone cladding. 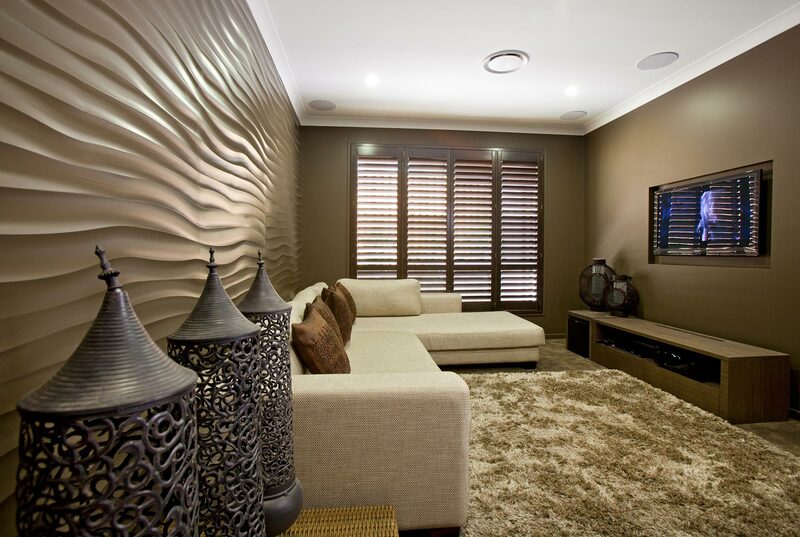 You will know when you have found the right wall texture when it complements the feeling and overall colour concept of your home while enhancing your decor and other personal touches. But most importantly as with all textural elements, you will feel an overwhelming urge to reach out and touch it. 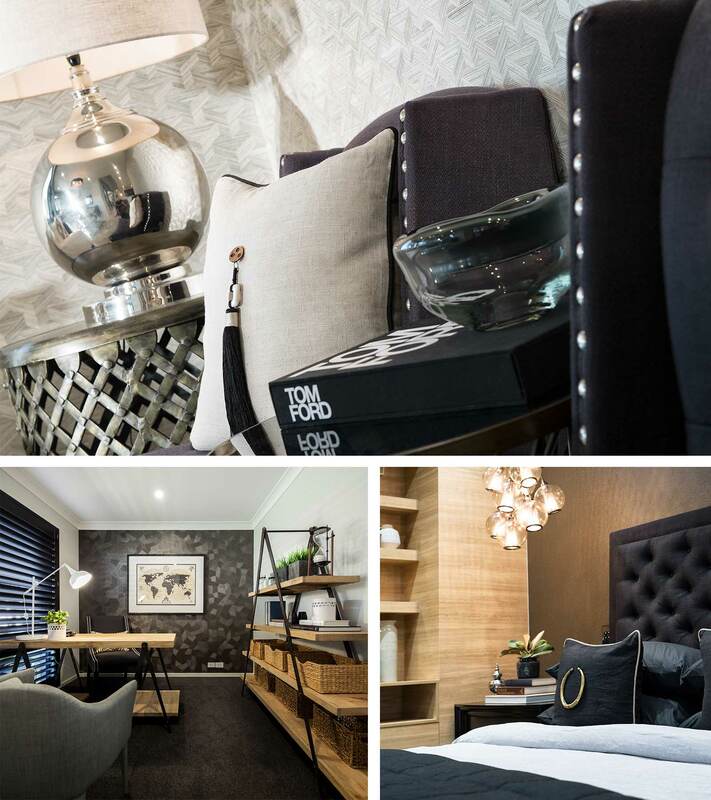 To experience textured cladding at its best we recommend a visit to our stunning display homes at Rochedale where you can see the spectacular Icona bathroom and entry cladding for yourself. 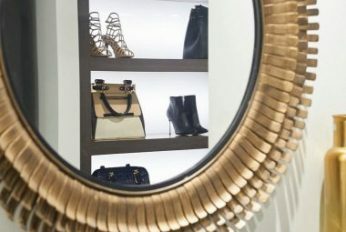 View previous post: "First steps in choosing the flooring for your home"
View next post: "Where fashion meets function – 5 tips for a fabulous walk in robe"